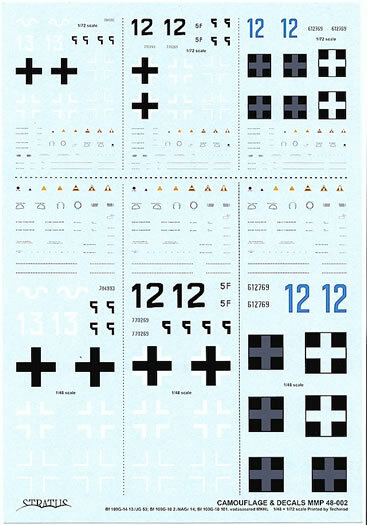 1 x A4 waterslide decal sheet of national insignia, code numbers, stencils etc for two Bf 109G-10s and one Bf 109G-14; four x A4 full colour, very high quality double-sided sheets containing detailed aircraft descriptions, 3 and 4-view drawings, stencil placement guide, RLM colour chips and line drawings of late model Bf 109 rudder variants. 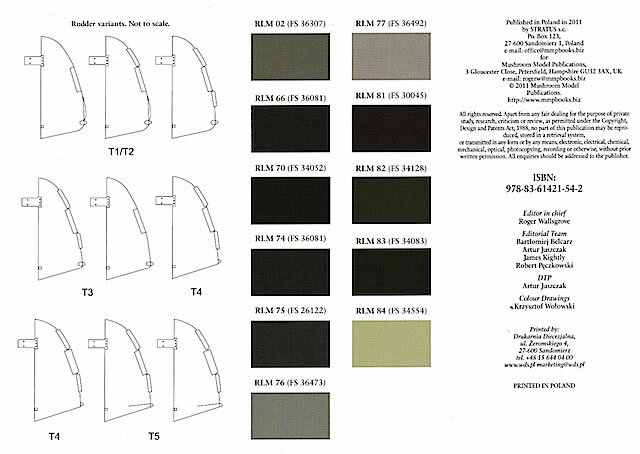 High quality decals and camouflage and marking illustrations are particular highlights. More information on several of the subject aircraft would have been welcome. 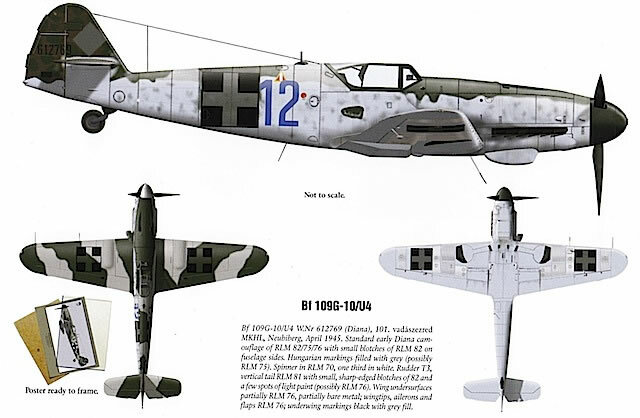 A deluxe package that covers three interesting and very different Bf 109Gs in style. Turning to the decals themselves, these appear very good, with markings and stencils provided for each aircraft in 1/72 and 1/48 scales on a very full single A4 sheet. The decals are by Techmod and are very crisply printed, with even the 1/72 stencils clearly legible. 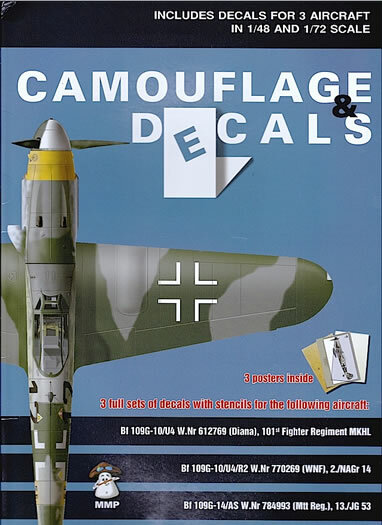 I like that a full set of stenciling is provided for each aircraft, which means that if a modeler wished, he or she could replicate all three aircraft in both scales without having to scrounge extra stencils from the spares box – a welcome rarity in decal sheets. Also welcome is the package’s overall deluxe presentation. Each aircraft is depicted on its own full-colour, glossy, double-sided A4 card. On one side of this is a starboard profile, upper and lower view drawing (except for “White 13”, where only an upper view is provided), and a detailed description of the aircraft; on the other side is a port profile and a basic description of the aircraft, presented in a style suitable for framing. 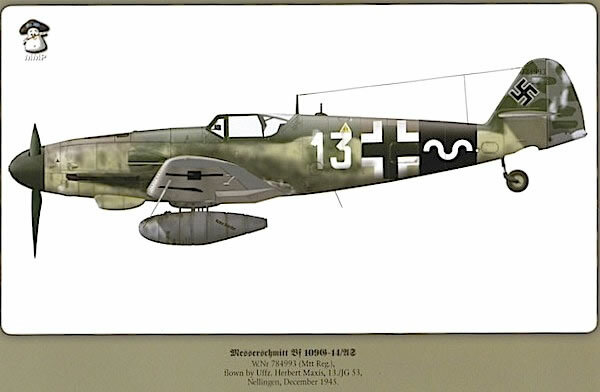 Another card of similar quality provides detailed stencil placement information on one side, and on the other a set of RLM colour chips and line drawings of nine different late Bf 109 rudder variants. I’m not an expert on either RLM colours or Bf 109 rudders, so can’t vouch for the accuracy of the information, but its inclusion is welcome. Finally, all of these cards, along with the decal sheet, are presented in an attractive and sturdy A4 folder, which if you wish will fit neatly in your bookshelf. 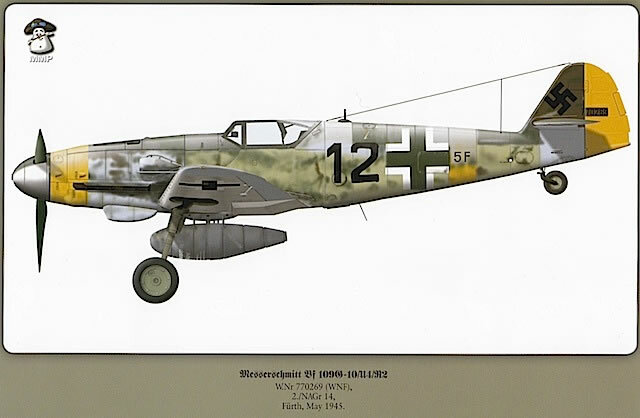 L. Ritger, “The Messerschmitt Bf 109: A Comprehensive Guide for the Modeller, Part 2: ‘F’ to ‘K’ Variants” (SAM Publications, 2007).